The files can all be queued up at one time by the user, eliminating the time-consuming process of using the mouse and keyboard to individually locate and open each file, and eliminating the process of saving each file to the desired format. A great deal of time is wasted each day by CAD users waiting for screens to regenerate. 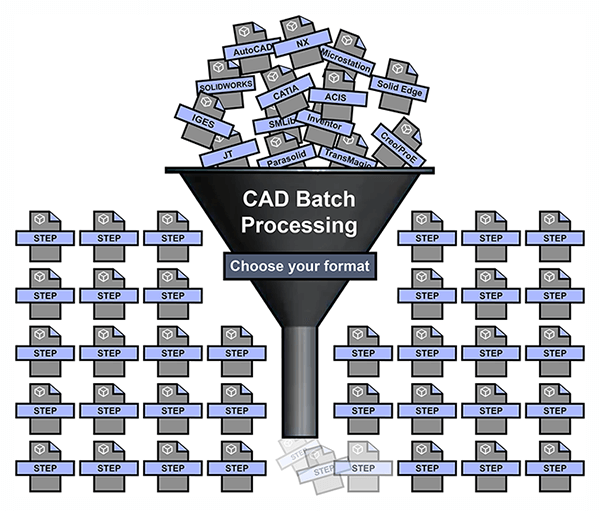 When you are batch processing CAD files, the files do not have to be rendered graphically on the screen since they are processed by the translator directly. While we’re used to having graphical feedback when we manipulate CAD files, ultimately it all comes down to pure data, and translating data is much faster without waiting for and interacting with graphical displays. The times above are the averages when running four random files through batch processing for each format and size designation, using TransMagic’s MagicBatch add-on. Thousands of files per hour? NX files in this benchmark translated in a mere 3 seconds each, which equates to over 1000 10MB files in under an hour; and that’s not even including the many smaller files that are often contained in assemblies. Recent customer data I’ve surveyed showed that only 10% of the files were over 10MB in size, 25% were 1MB or over, and 65% were less than 1MB. That’s a total of 3000 10MB files, 150 50MB files, and 30 100MB files processed while the engineer or designer is not even present! In fact, we have customers who do exactly that; they wait until their customer files come in and batch process them overnight or over the weekend to save processing time during working hours. Need repair? MagicBatch can automatically run Lite Repair on every file, or, if you have the MagicHeal add-on you can automatically run Full Repair on each file as well. So the next time you find yourself plodding through the tiresome task of File > Open, waiting for the file to render graphically, then invoking the File > Save As process, consider giving automated CAD translation a try! Learn more about MagicBatch here. How do you Compare CAD Models?